Left conveyor in 1989.02.28 in poverty spec, CL, had 1.3 carb engine, 084 4 speed gearbox, used to have OEM fog lights and I'm glad that it had both outside mirrors When it came in my possession, it met the same fate as my other car, B3 A90q, which is off the road for past few years - it became a constructor, filling up with equipment, so now it has power windows, power mirrors, cruise control, MFA, mk4 central locks, headlight washers and so on. 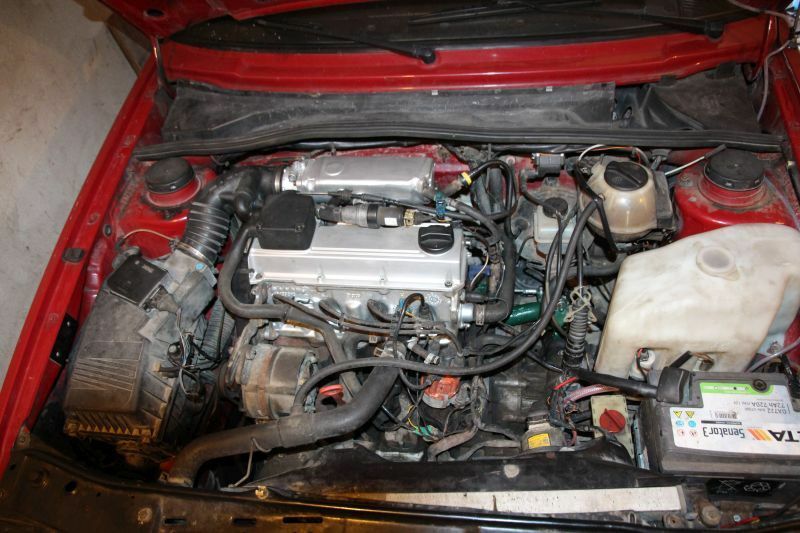 I also had plan for better engine, so when increased pressure in cooling system was found [caused by corroded head], there was no question about what to do - so in the end 1991 Seat Toledo with 2E 2.0 8v engine was found, ideal donor car to turn mk2 golf into GTI 8v, as it contains all the necessary parts - powertrain, exhaust, anti roll bar, bigger brakes, disc brake rear axle and some other things. 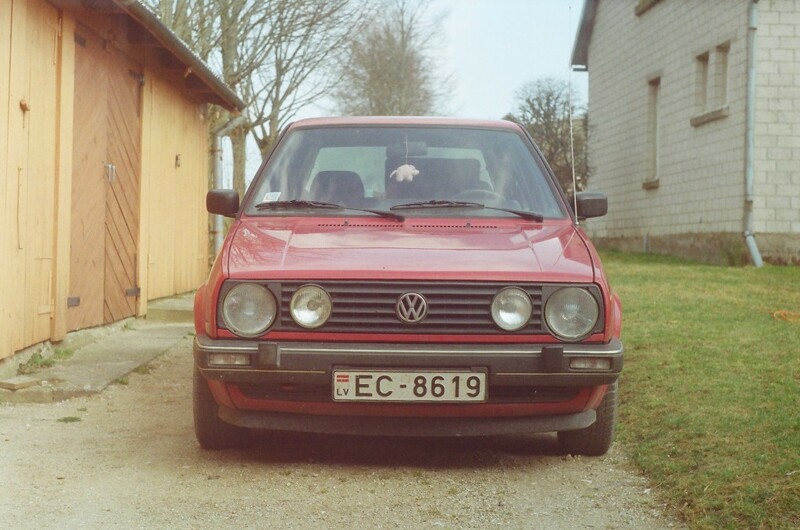 Year and half ago engine was swapped into golf, due to having donor car, and one which is based on mk2 chassis made the swap really straightforward. Relatively recently the engine compartment looked like this. While I did just table tests, I ran into strange issues, which were solved with help from GintsK. Engine management has been wired up in OEM style; engine loom from Seat Toledo is in two parts, engine management half which plugs into another half - in non-management half I put thicker wires for engine management power; everything needed for VEMS was already there - ECU power from ECU relay, injector and IAC power, ignition coil power and what used to be separate ignition power for ISV now is power for WBO2 heater. Afterwards, in the morning, when having a 30 km drive to church with my wife, I did my first VE tuning, on the way back there was another tuning, and this time I was stopped by unmarked road police car, due to my erratic driving, to check if I'm not drunk... Did some more tuning and corrections early monday morning, but that clearly is just the beginning. Currently the car starts, runs and drives. It runs good, actually feels better than digifant, as it had, I guess, worn MAF potentiometer at some low load area, causing some shuttering at that load - now it's better, only it reacts on flooring the throttle with some kick, I guess must be because there is no WOT enrichment... Cold engine starts quite good, only, I guess, cranking IAC duty must be decreased, when engine comes alive, it first jumps to ~1,6k or more and then settles to 1,2-1,3k . Warm engine doesn't really want to start - when I was in such a situation yesterday, on a first try engine started and died right afterwards, on next try it didn't wanted to start until some throttle was applied - do I really need some starting enrichment for engine @ 90c? Idle is the biggest issue, and I'm not talking about fine idle, as I've turned PID control off and I'm not in a position to enable it - idle has tendency to jump in 500-1500 rpm range and sometimes engine will stall... I found that VE tuning with Live VE analyzer, with autotune ON has resulted in some incorrect measurements - with warm engine idling @ 1,4k/30 kpa [not target, just happens to be like that] I noticed that lambda target was 0,95, but actual lambda 0,7. so I manually decreased value of that cell until I got 0,95 [from 40 to 30] and set slightly higher values in nearby cells in which idle might fall into - how could this happen? Because I haven't tuned injector opening times? Or maybe because second time I tuned VE table, I didn't turn on EGOC? Ignition for now is acceptable - well, maybe some changes in idle area is needed, any input welcome - other than that - engine feels strong and I cannot hear any knock; I used to hear engine knocking, as it turned out that someone before me had turned earlier ignition. In near future I'll try to borrow timing gun to fine tune primary trigger settings. I'm running the engine with 98 RON fuel, as that's what are these engines made for. So, some eight months and some dozen thousands of kilometres have passed, learning quite a bit about tuning and VEMS in general. 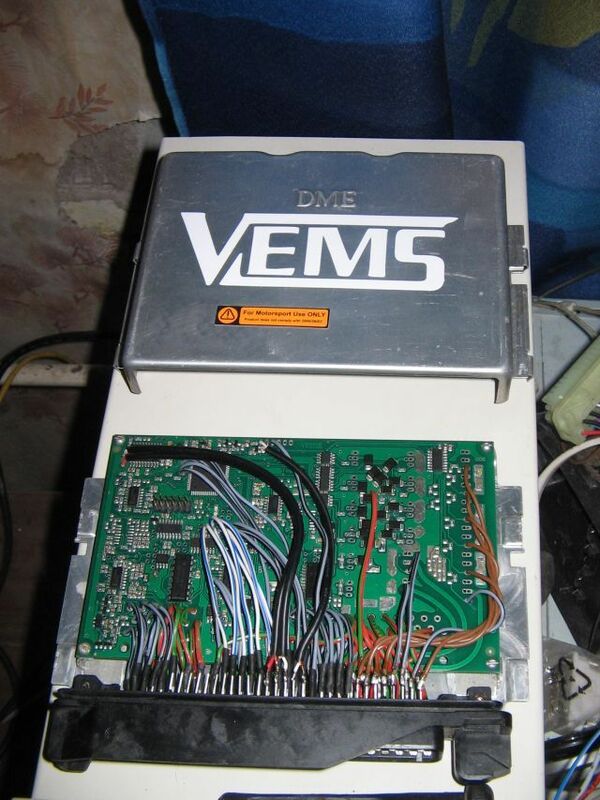 First I filled some important gaps in my knowledge about VEMS hardware with help of Gints; turned out that I had missed that I need to put some parts for 30v flyback in my ECU, so injectors weren't behaving good - when that was fixed, it also turned out that ISV also needs some diode, and that was fixed too. Then I learn't that my MAT sensor placement is bad; suitable for some motronic or digifant, but no VEMS; in front of throttle, that realization also come with some tip from Gints. So for now I've managed to tune MAT/TPS correction map so that when I drive on highway with everything fine, and I come to town and start to stand at the traffic lights, everything stays more or less fine - showing that the air temperature changes much less than temperature reading - the inevitable downside is that after stopping warm engine for some time, it is being overfueled for at least 10% - but I guess that's the best I can get for this sensor placement. Current fuel maps looks like this, petrol on the left, LPG on the right. Yeah, petrol map is messy, because of some calibration changes and some partial tuning, also, now I'm not revving the engine high due to mechanical problems, so I've finetuned range that's being used in normal driving. Meanwhile LPG map looks interesting - when reducer wasn't able to provide sufficient fuel, it looked similar to ordinary petrol map - with new reducer it looks like this, and I still need to remove some fuel at the top and add some at the bottom, and I don't know how that looks at the high revs, because I haven't revved engine past 4k for quite a long time. I also noticed the lack of evaporation cooling effect on LPG; MAT/TPS correction map for LPG is still the same as for petrol; when I had to stop @ some roadworks, in a few minutes EGO 100% went to EGO 94%, which would't happen on petrol. What will be next? Well, I have two problems - the engine is reaching end of it's useful life - it received new crankshaft and both sets of bearings half year ago yet there's still some rattling, piston pins maybe, and now it has also started to emit some oil smoke after being started - and I want impulse wheel, as the current setup of random sequential injection using coil type trigger is at least partial cause for a couple of issues. 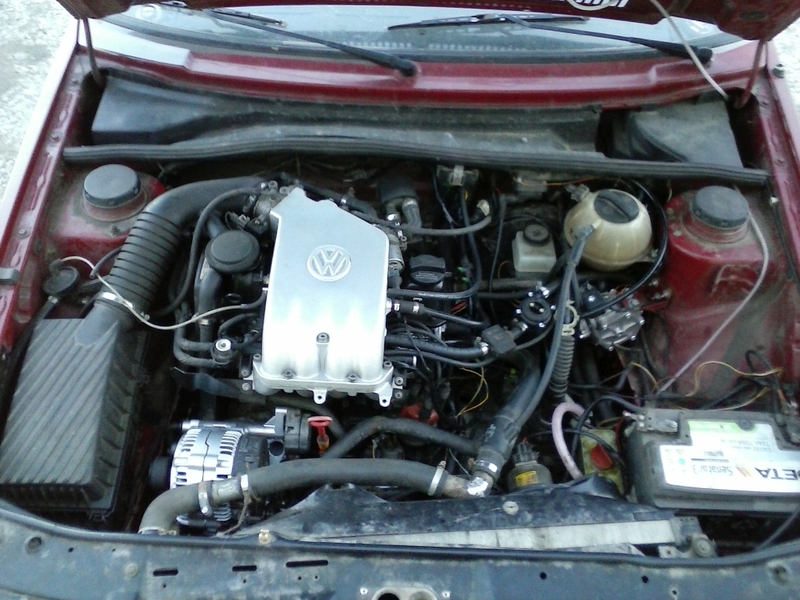 Since new OEM 60-2 impulse wheel kit costs approx 80 euros, but another engine in junkyard with impulse wheel costs 100 euros, the logical solution was to get another engine, so now I have bought an engine from early Seat Alhambra [VW Sharan], which was successor of 2E in VW's engine lineup, ADY. I took it apart and did some measurements of crankshaft - crankshaft is fine, but I need new bearings for crankshaft and dizzy/oil pump drive shaft; I'll have yet to inspect pistons, there's some scratches in cylinders caused by careless changing of spark plugs without cleaning holes first, but that will do, at least for now. So I need to buy a lot of new parts for that engine, drill holes in head for LPG nozzles, like I've done for head of existing engine, so that nozzles are pointing at the intake valves. 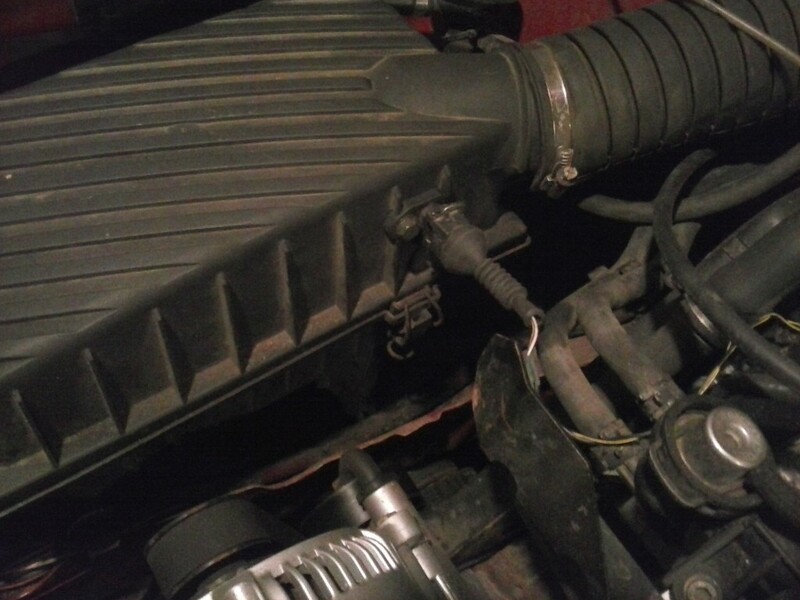 Since Sharan engines have different manifolds, I'll have to reuse my existing exhaust manifold, and I have prepared another 2E intake manifold, which will have MAT sensor from audi 2.6 V6 mounted midway in intake runner of 4th cylinder; hopefully that will provide temperature measurement which will be more in tune with reality. I also plan to use ADY fuel rail and injectors, as that will allow me to get rid of 2E fuel rail which has unneeded output for cold start injector. After that engine will be in and impulse wheel will be on, I also will switch to wasted spark ignition, using two coils from audi 12v V6 coilpack. After my last post happened some change of plans. 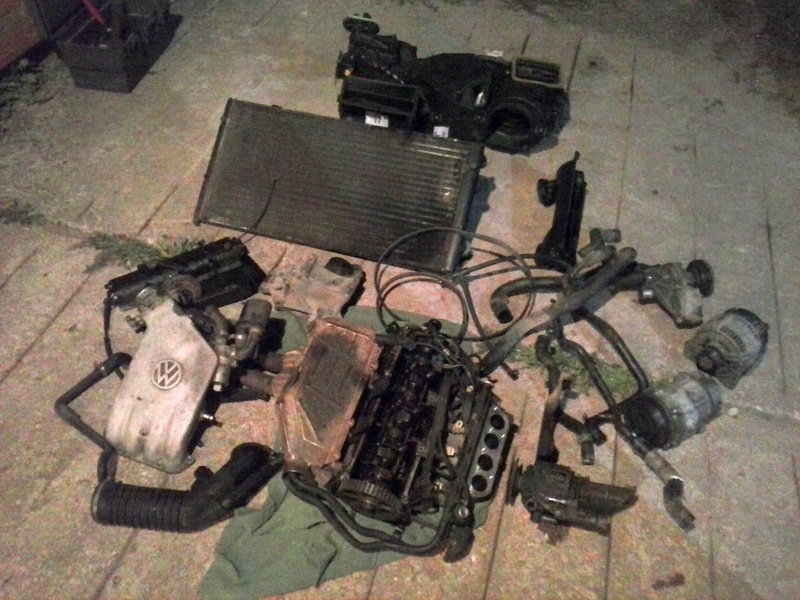 I had bought complete ADY engine, but it happened that I learn't about VW 8v crossflow engines - and early one, 1.6 AEK, appeared in my favorite junkyard. So I took all head and intake related items + since it would give me some trouble to get V-belt setup working with this engine [likely would require 16v stuff] and I plan to have AC someday, and v-belt setup with AC in VW's is awkward - I also took all the ancillaries. ...so I ended up with ABA-like clone - 2.0 8v crossflow engine. It probably pulls slightly better than counterflow engine - likely that additional power is somewhere higher, as below 2k rpm it feels more sluggish than previous engine; likely it has similar strength there, simply more power higher. What is more important, it suffers noticeably less from intake heating. At first I had trouble to get engine running from built in impulse wheel, forcing me to drive more than thousand kilometres using 2E dizzy and coil type trigger. I was growing desperate and I planned to switch from hall to VR, so I ordered VR6 impulse wheel sender, but then I remembered that hall is just pulling down relevant input and when searching in internet for ABF primary trigger [the same sender, but engine is more prone to receive VEMS than ADY or AGG ] I found out about primary trigger pullup resistor values, so another resistor was added and that solved the problem. Then I swapped 2E dizzy for ADY dizzy but I had problem getting the engine running with camsync, as enabling it made engine running on two cylinders, but kamuto helped on that Unfortunately that dizzy had glitchy hall sender; after approx 5 km on road it always disappeared, making VEMS throwing "too less sec trig" error, so I was driving like that for a couple of months, until finally a couple of days ago I swapped my dizzy for another ADY dizzy - this one seems fine. 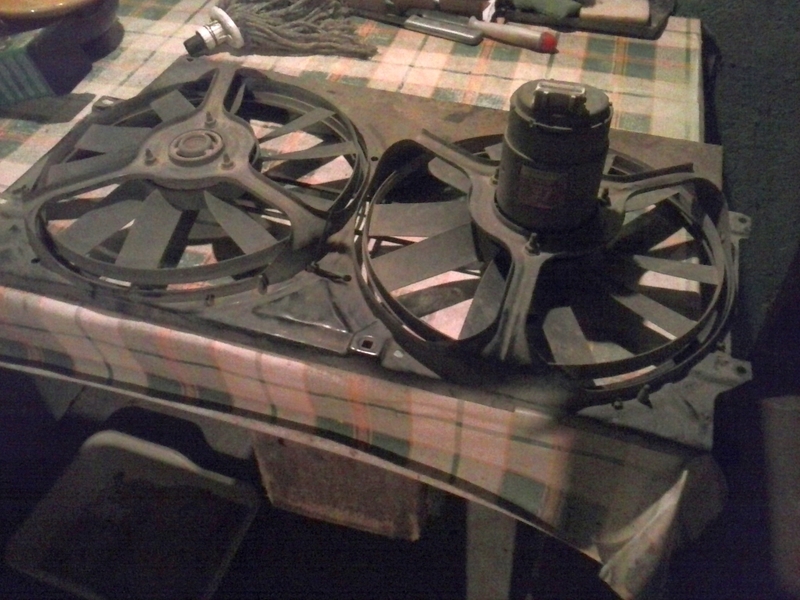 I also had encounter with mechanical issues - for example, in order to get alternator to run right, I had to buy in total two multigroove belts, tensioner roller and tensioner itself - first belt was few milimetres longer than specified in ETKA and it slipped, and I had to buy new tensioner to find out that the belt is simply too long; this being my first experience with multigroove technology, as all my previous engines ran V-belts. Returning to VEMS - previous winter my engine tended to have cold starts like pump diesel with dead injectors, and I had stopped increasing crank enrichment simply because once @ -15c when I had slightly increased cranking enrichment, I ended up with flooded engine... So I had some 175% cranking enrichment @ 0c, or so, until I stumbled upon S2 forum thread about this, where prj had posted 2.2 20vt motronic stock cranking enrichment figures, which were way higher So I started to add more cranking enrichment, but this time a lot, not just a little, and that finally gave the improvement, not flooded engine, so lesson learn't - when you have just half of necessary cranking enrichment, there's a point where adding just a bit more fuel ends in a situation when there is not enough fuel for a start but enough to flood the engine, at least when injectors are batch firing during startup. When I installed this engine and got impulse wheel running, I changed that setting to separate injector action, that gave some nicer starting - currently cold engine during startup misfires a couple of times and then fires up, I guess it could benefit from some small refinements, but currently that's low priority. What will happen in the future? This engine, despite receiving new bearings and new piston rings, makes some nasty clacking while cold and in higher revs makes some rattling; it's either conrod/pin issue, or simply cylinders are worn too much - I'm a novice in engine mechanicals; I naturally prefer wiring over mechanical things - so as a stopgap measure I recently bought another ADY bottom end, this one probably is in better shape, as it's from corrado [less load to pull than sharan] and it seems like it has been run on synthetic oil - I'm not in a hurry to install it, but probably in the summer that will happen, after some bearing inspection and seal replacement. This problem also prohibits me from enabling knock detection, as engine rattling may interfere, causing VEMS to think engine is knocking... Next thing that will happen in the future [but likely earlier than bottom end swap] - since I'm mainly after low end torque, not top end power [that would be silly with 2v engine anyway], there's some room for some improvement - I'll soon get AFT intake, which has variable length manifold - VEMS will be able to handle that intake just fine Bigger problem will be the fact that AFT comes with throttle that contains idle speed motor, like many mid-nineties VAG engines had; I had searched in internet about VEMS abilities to handle this kind of setup and I'm aware of VEMS software limitations - well, I'm going to try that anyway, as I want clean install, not some ISV butchered in somewhere - that will be last resort. 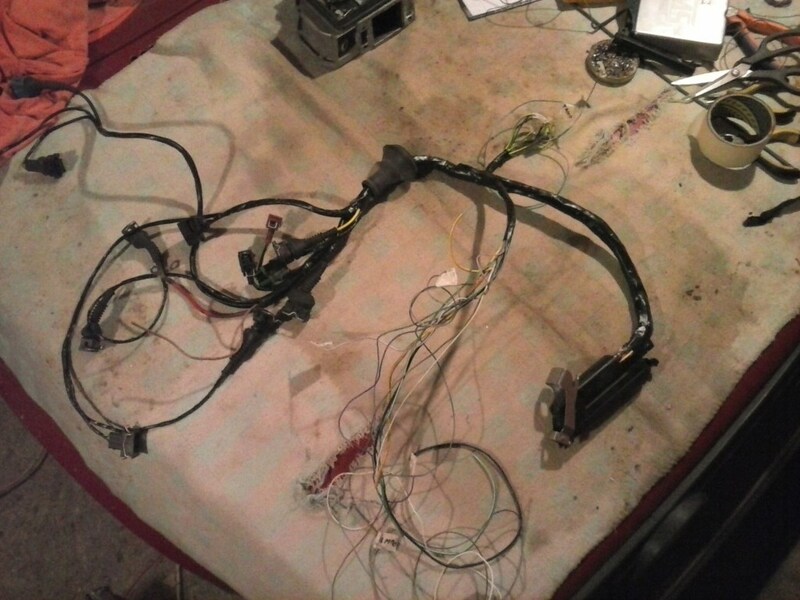 I also want to finally go wasted spark; that was my intention from the start, my loom has been made for audi V6 ignition amplifier and current 2.0 coil is connected with adapter to it - the problem is that I cannot find usable place on engine where I could attach the coils; the engine compartment is too full Since this is not urgent, I'm still running dizzy ignition. Finally, in the future I plan to make early mk3 style engine loom, that will also contain some improvements, like shift light and vehicle speed signal for ECU. So have been these problems mentioned here http://www.vems.hu/wiki/index.php?page=InTake%2FThrottlePlates%2FVAGPassiveThrottle overcome by now?